· ‘Watch & Act’ – there is a heightened level of threat. Conditions are changing and you need to start taking action now to protect you and your family. · Be aware that access may be restricted to some local roads in the area. The Tuross-Kybeyan road currently has restricted access. · If you plan to leave, leave early. Stay informed about current fire conditions in your local area via radio, RFS website or call the NSW RFS Bushfire Information Line on 1800 679 737. · It is important that you make arrangements now for what you will do with your stock or animals in the event of evacuation orders. Most rivers are fishing well water levels are good in most rivers. Are Klinkhammers, adams parachutes, red tags, royal wulff, B/H Nymphs black and brown. The key is to fish at the right time off day mornings and afternoon you will have a better time. The Eucumbene river is still flowing good but the fishing has been hard again fish late in the afternoon not In the middle of the day most of the fishing has been alright up higher around Kiandra and down into the gorge. Best fly’s are red tags, Klinkhammers, B/H Nymphs, stimulators, Hardy’s favourite. Remember go fishing at the right time and you will have a better time. Best fishing is around Rushy’s bay seven gates and middlingbank. Most off the fishing has been good in the afternoon with a good number off browns coming in on the Dark. Do the same with B/H Nymphs you will be surprised well that’s the best tip I can give at the moment it has been working. 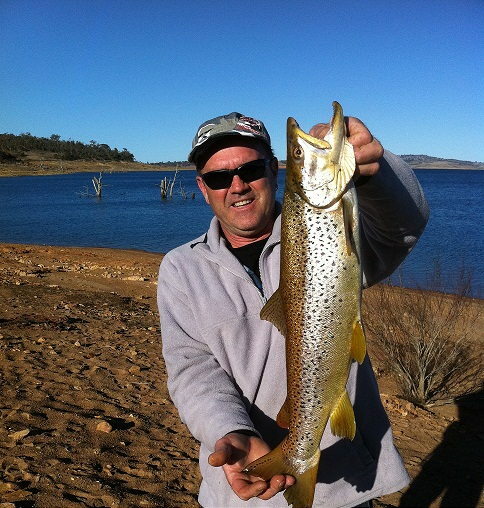 Reports from Tantangara have been picking up with good numbers of fish coming in worth a fish. Lake Guthega good reports of brown close to the shore line so if you like the high country try this lake you will be surprised. Three Mile dam if you like to catch up on your dry fly fishing this is a good spot to do that plenty of small fish but really good fun and a good day out. Most fish have been taking them about 40 meters out with some good results. the best lure has been the strike pro blades inGold, silver, brown, black, try them you will be surprised. Lures like Celtas and Rapalas have been working well if you haven’t tried these lakes get up there. We have seen very hot weather over the last few weeks and has slowed the fishing a little. From the bank it has been tough going with very few caught on power bait, mud eyes have been doing reasonably well especially the spiders. Fly fisherman are catching them from dusk till 11 at night. We had Thomas Pahor catch his first trout fly fishing with a black muddler and Adam Cox caught a nice brown with mudeye pattern 65cm and it weighed 6.6lb. With Trolling we are seeing them caught very deep 40 to 60ft and majority at Wainui Bay early morning and later afternoon seem to be better times and Tassie devils with pink or yellow definitely the time for down riggers with water temperatures rising. Hope to see you soon at Buckenderra. best bait is worms and Mudeye's. Mudeye’s are back in stock now and are producing some good fish at Eucumbene worm as well have been the stand out Bait with some good browns been caught. And rainbows been caught power bait has been working alright in most places. Best areas are seven gates, Middlingbank, old Adaminaby, anglers Reach and Rushys bay. If you can catch some grasshoppers try them under a bubble. Most off the bait fisherman are doing well all around the lake so if you want to get them browns there are plenty of them about. 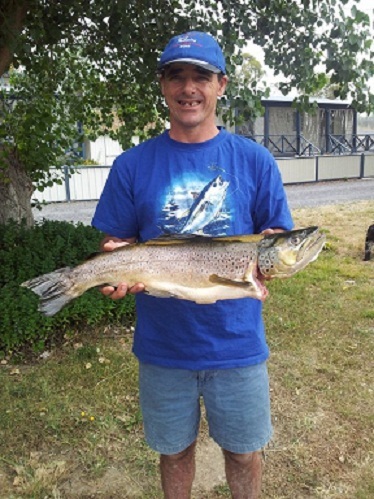 Hubby and I love our fishing and follow your fishing reports on a regular basis. The web cam at old Adaminaby is fantastic as well. We took a midweek trip to Old Adaminaby on Tuesday 21st August. Arriving at 3pm we located a lovely spot on lake Eucumbene. We fished from the bank using powerbait, a mix of orange chartouss and rainbow. The old bardy grub and as you have suggested a scrubby under a float, they all caught fish, thanks of the advice. Hubby Craig caught this big brown trout 63cm, 7 pound within the first 10 minutes of setting his rod, his old faithful ugly stick he has owned for 20 years. In total 13 fish mostly browns all between 37 to 47cms all in very good condition so a very good trip. We even had two double hook ups = two fish on one rod. Once with two browns and within a hour with two rainbows very rare I would have thought? Just wondering if you can help out with the large colour variation in the rainbow trout pictured, are the different varieties? As you can see one has black fins and very dark in colour. Maybe a Brook Trout?